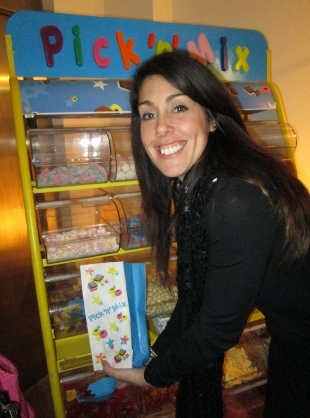 A unique and somewhat different way of attracting existing and potential clients to visit your exhibition trade stand for a little pick and mix time to spend with them and a chance to sweeten them up! Visual and with Promotional use. We offer dedicated Pic & Mix stands with 20 dispensers as an exhibition trade stand attraction and you can make the sweet selection from hundreds of available sweeties as Link : Sweetie Choices. From the pick n mix stand hire. 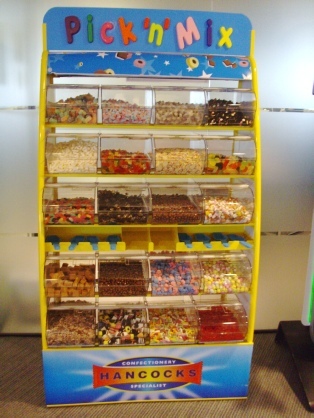 The pick and mix sweet stand can be covered top bottom and sides with your corporate logo / design. Conference idea. Use this great idea to attract potential customers on to your trade stand. It may be just the job. These 'Pick and Mix' Stand(s) can be hired as an Exhibition Stand Attraction with a difference. Promote you company logo or message on the front (top and Bottom) the sides can also be used. G-Mex Centre, Hilton Brighton Metropole Hotel, ExCeL, Manchester Central Convention Complex, Novotel London West, National Exhibition Centre, Old Billingsgate, Olympia, Queen Elizabeth II Conference Centre, Ricoh Arena, The Royal Armouries Museum, Sandown Park Exhibition and Conference Centre, Stoneleigh Park, Telford International Centre, The O2 Arena, The Brighton Centre, Cardiff International Arena. UK.